John Jay, having been named minister plenipotentiary to Spain, sailed for Europe on October 20, 1779, accompanied by his wife Sarah. Their ship Confederacy met with severe weather and barely made it to Martinique where there was a considerable layover until another vessel could be secured. Catharine (Kitty) Livingston wrote, on 13 February 1780, to her sister from Philadelphia, expressing her concern. How my dear sweet Sister was you supported in the hours of trial and danger; the appearance of death in so terrible a manner must have awaken[ed] every fear. You have indeed seen the wonders of the deep, and experienced in a remarkable manner the goodness and mercy of an indulgent providence. Your Friends have all reason to bless and thank God for his interposition in your favor, and it ought to console and encourage us to trust in the Author of your Salvation—For he spoke and it was done. he commanded and it stood fast. Our Winter set in earlier and with more Severity than is remembered by the Oldest liver among us. The year thirty five, and forty is agreed from circumstances not [to] be compared to this; in neither of those severe Seasons was the Chesapeake at & twenty Miles below Anopolis a firm bridge as is and has been a long time the case. In Virginia it has impeded all Trade, several of there Vessels have been cut to peices and sunk by the ice. The Merchants here think many of there Vessels that they expected in have perished on our coast, the last that got in was the Jay*; and that was in November, and she was much injured by the Ice and it was expected for several days that she and her cargo would be lost. To the Eastward the Snow impeded all traveling to the State of New York—it cut of[f] Communication from Neighbour to Neighbour. The last accounts from Fish Kill it was four feet deep on a level. Numbers of Families in this City have suffered from its severity altho many among them made great exertions for their releif. In New York the want of fuel was never known like it, they cut down every stick of timber on Mr. Byard’s place** and would not permit [him] to keep any tho he offered to buy it. Several gentlemen went upon long Island and felled the trees, and after bringing it to town with their own horses it was seized for the Kings Troops [New York was occupied by the British], its reported of two families that the want of wood obliged them to lay a bed a week . . . .
* The ship, the Jay, was a Pennsylvania vessel of eighteen guns. There were three other vessels in the Continental service named Jay. One was Lady Jay. They saw action in the Revolution. ** William Bayard was a New York merchant who, initially sympathetic to the Patriot cause, ultimately became a firm Loyalist. And we complain of the frigid weather and snow we have had recently (and, no doubt, more to come) when most of us are comfortable in our heated houses and can stay warm under our electric blankets!! Kitty Livingston was not exaggerating in her description of the winter of 1779-80. George Washington, from his winter quarters in Morristown, New Jersey, wrote to Lafayette in March 1780, “The oldest people now living in this Country do not remember so hard a winter as the one we are now emerging from. In a word the severity of the frost exceeded anything of the kind that had ever been experienced in this climate before.” There were twenty-six snow storms in New Jersey, six of which were blizzards. The illustration shows the type of hut soldiers encamped at Jockey Hill near Morristown occupied. Kitty’s letter is in The John Jay Papers in the Columbia Digital Library Collections and can be seen HERE. Here are the remaining entries for January 1777 from the journal of MARGARET HILL MORRIS. 3d—This Morning between 8 & 9 oClock we heard very distinctly, a heavy fireing of Cannon, the sound came from towards Trenton, about noon a Number of Soldiers, upwards of a thousand came into Town in great Confusion, with Baggage & some Cannon—From these Soldiers we learn there was a smart engagement Yesterday at Trenton, & that they left them engaged near Trenton Mill, but were not able to say which side was Victorious. They were again quarterd on the inhabitants, & we again exempt from the Cumber of having them lodged in our house—Several of those who lodged in Col Co [Colonel Cox] house last Week, returnd to Night, & askd for the key—which I gave them, About bed time I went in the next house to see if the fires were safe, & my heart was melted with Compassion to see such a number of my fellow Creatures lying like Swine on the floor fast aSleep, & many of them without even a Blanket to cover them. It seems very strange to me that such a Number shoud be allowd to come from the Camp at the very time of the engagement, & I shrewdly Suspect they have run away for they can give no account why they came, nor where they are to March next. 6th [actually the 4th]—the accounts hourly coming in are so Contradictory & various, that we know not wch to give credit to. We have heard our people have gaind another Victory, that the English are fleeing before them, some at Brunswick—some at Prince Town. . . . a Number of Sick & wounded brought into Town, calls upon us to extend a hand of Charity towards them—Several of my Soldiers left the next house, & returnd to the place from whence they came, upon my questioning them pritty close, I brought several to confess they had ran away, being scared at the heavy fireing on the 3d—There were several pritty innocent looking lads among them, & I simpathized with thier Mothers when I saw them preparing to return to the Army. 5th—. . . . We are told to day that Gen. [Hugh] Mercer is killd, & Mifflin wounded—What sad Havock will this dreadful War make in our Land. . .
9th. . . . We hear Washington has sent to buy up a Number of Stoves, from whence it is Conjectured he is going into Winter Quarters—The Weather very cold, more snow falling has almost filld the River with Ice & we expect it will be strong enough to Walk over in a day or two. . . In January, George Washington, with what was left of the Continental Army, set up winter quarters in Morristown, New Jersey. 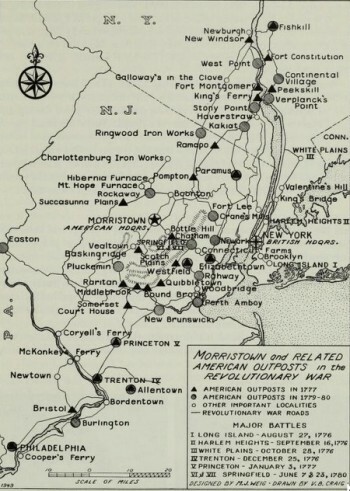 Morristown was a particularly good strategic location—defensible, protected by the Watchung Mountains, the Ramapo Hills, the Hudson Highlands, and swamplands to the east—from which Washington could monitor British activity in New York, the Hudson River, and Philadelphia as well as the surrounding area in New Jersey. After losses in the recent battles, the expiration of enlistments, and desertions, the army had shrunk to a new low. In order to reorganize, discipline was tightened and recruitment were was increased by the offer of cash bonuses and, for those who enlisted for the duration, a bounty of land to be claimed after the war. Washington also undertook a plan of mass inoculation against smallpox including not only the troops but also the civilian population. Washington and his forces remained in Morristown until May. Source for quoted passages: In the Words of Women, pages 102-03. The map is from Morristown—A Military Capital of the American Revolution, by Melvin J. Weig, with assistance from Vera B. Craig, National Park Service Historical Handbook Series No. 7, Washington, DC, 1950, reprinted in 1961, page 5, online HERE. My colleagues and I gave a presentation at the National Historic Site in Morristown, New Jersey earlier this month. I’m on the left (the blogger Janet Wedge); Landa Freeman is in the center; and Louise North is on the right, We three are the compilers/editors of In the Words of Women. The museum and the auditorium were lovely. Unfortunately the lure of the Jersey shore on that hot Sunday resulted in a rather small audience, nevertheless our presentation was well received. Louise North was able to include quite a lot of material from her new book The Travel Journals of Henrietta Marchant Liston. And I got to read this wonderful letter to her sister-in-law by MARTHA DANGERFIELD BLAND who joined her husband, a member of George Washington’s staff, in Morristown in 1777 during a lull in the fighting. Considering this was after a severe winter and in the middle of a war with Britain, everyone seemed to be having a rather nice time. May 12, 1777. . . . I left Philadelphia last month (the first day) & came to Morristown where Genl Washington keeps Headquarters. Mrs. Washington had arrived three weeks before me, so that I could with a good face make a visit to Camp. . . . I had many Qualms of consiance about visiting a camp. . . . I found Morris a very clever little village, situated in a most beautiful valley at the foot of 5 mountains. It has three houses with steeples which give it a consequential look . . . it has two familys—refugees from New York in it otherwise it is inhabited by the errentest rusticks you ever beheld—you cannot travil three miles without passing through one of these villages all of them having meeting houses and court houses &c &c, decorated with steeples which gives them a pretty Airy look & the farmes between the mountains are the most rural sweet spots in nature, their medows of a fine luxuriant grass which looks like a bed of velvet interspersed with yellow blue and white flowers. They represent us with just such scenes as the poets paint Arcadia: purling rills, mossy beds &c but not crying swains & lovely nymphs tho there are some exceeding pretty girls. . . . realy I never met with such pleasant looking creatures, & the most inhospitable mortals breathing; you can get nothing from them but “dreadful good water” as they term everything that is good. Desperate and dreadfull are their favorite words, you’d laugh to hear them talk. . . .
Assending from small to great things—now let me speak of our Noble and Agreable Commander (for he commands both Sexes) one by his Excellent Skill in Military Matters, the other by his ability politeness and attention. We visit them twice or three times a week by particular invitation—Ev’ry day frequently from Inclination—he is generally busy in the forenoon—but from dinner till night he is free for all company. His Worthy Lady seems to be in perfect felicity while she is by the side of her Old Man as she calls him, we often make partys on Horse Back the Genl his lady Miss [Susan] Livingstone & his Aid de Camps who are Colo Fitz Gerald . . . Colo Johnson . . . Colo Hamilton a sensible Genteel polite young fellow a West Indian—Colo Meade—Colo Tillman . . . Colo Harrison . . . Capt Gibbs. . . . These are the Genls family all polite sociable gentlemen who make the day pass with a great deal of satisfaction to the Visitors—but I had forgot my subject almost, this is our riding party Generly—at which time General Washington throws off the Hero—and takes on the chatty agreeable companion—he can be down right impudent sometimes—such impudence, Fanny, as you and I like. . . . The letter can be found on page 109 of In the Words of Women.